It's amazing what Adria has packed into the Altea 472DS Eden – take a look! Of the brands that have thus far revealed their 2016 tourers, it’s fair to say that most UK caravan manufacturers have opted to keep change to a relative minimum for 2016. And Slovenian brand Adria seems to be treading a similar path for the coming season, electing to give one existing model (the Adora Isonzo) its long-awaited ‘Silver Edition’ treatment, and introduce just one more in the same livery. That new model is called ‘Eden’ (like its siblings, it’s named after a river – or, to be more accurate in this case, three, since there are River Edens in Cumbria, Kent and Fife), and it’s the latest addition to the entry-level Altea range. Eden is currently only available in special edition trim (although we’ll be amazed if it doesn’t become a standard model for the 2017 model year), which brings with it an all-silver body and a whole host of additional equipment. Of rather more interest, however, is its intended customer. 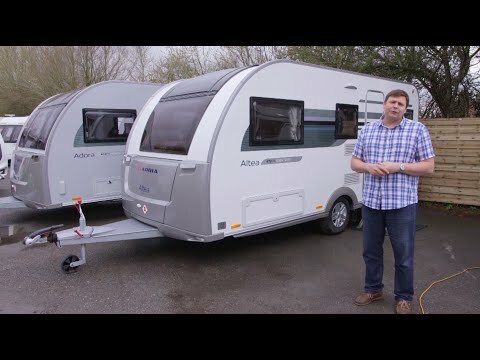 If you're looking at Adria caravans for sale, you'll of course know there are already family layouts within the Altea range, but both the Severn and Trent weigh in the region of 1450-1500kg, which is well into large SUV tow car territory. Eden, on the other hand, is tipped to weigh no more than 1300kg all-in (although this had yet to be confirmed at the time of writing), which brings it well within the reach of caravanners with smaller, lighter tow cars. Where the Adora Isonzo Silver Edition is quite a striking and unusual-looking caravan, Adria has been a little more restrained with the Eden Silver Edition, restricting the silver treatment to the lower half of the ‘i Shape’ body front and rear and the side wheelarch and skirting. The result is a thoroughly handsome-looking caravan, especially when you spot the special edition-spec alloy wheels and panoramic front rooflight. Certainly, it belies its good value £15,390 asking price. It’s as impressive in practical terms, too. The habitation entrance door doesn’t warrant a window and the angled and heavily inset front corner steadies in particular are a little tricky to reach, but all the major services are located on the offside wall, with the sole nearside locker door affording access to the bedding locker beyond. The trademark front gas locker feels as beautifully engineered as ever, too, with ample space within for a pair of gas cylinders and sundry other camping chattels. It’s good to see that the super-long A-frame (for improved towing stability – plus it affords easier access to the tow car’s boot) has been retained, too, and while the model in our photos has a strangely denuded hitch, production models will have an Al-Ko AKS hitch stabiliser fitted to them. The Eden’s lounging facilities are unquestionably one of its biggest attractions, sporting as it does not one, but two entirely separate living areas: one up front; and one tucked away in the rear. The former is aided considerably by the presence of the special edition-spec panoramic opening rooflight, which comes fitted with its own flyscreen and night blind. Come night time, choose between the pair of adjustable reading lights and ambient strip lighting above the cupboards or the trio of halogens sunk into the rooflight surround. Seating is typically continental, as we expect from Adria caravans, with the traditional central chest of drawers binned in favour of a small folding flap (there is a folding table squirrelled away in the kitchen), which in turn opens up a central seat base in front of the main window. It’s a little upright, but means you can probably squeeze five or six people in there at a push. The one out back is a little more traditional, with its clip-on table, but again can probably seat up to six people either around a board game or down to dinner. Lighting is again a combination of ambient strip lights and a pair of readers, while the pod in the ceiling contains a small rooflight and three halogen lights. There’s a dedicated TV station here, too, complete with a large surface area for digiboxes or DVD players, a fitted mounting bracket and accompanying mains and aerial sockets. One of the big pluses in here, too, is the standard of the woodwork; we love the pale yet warm colour, the distinctive grain marks and the fact that there are no fussy visible latches anywhere in the caravan apart from on the washroom door. It all looks very clean, uncluttered and modern. The Adria Altea 472DS Eden shares much of its main kitchen furniture with other models within the range, which in turn opens up a decent amount of worktop space. The hob, too, is a clever design, incorporating three inline gas burners which form part of a single-piece unit combined with the adjacent sink. As such, any saucepan overspills drain away immediately. Locker space is a bit on the meagre side, with little to speak of at lower level and just a split-level roof locker higher up, but the kit list is good, with a decent-sized fridge and in-built freezer, a Thetford Duplex combined oven and grill and a fitted microwave oven. Most of the major controls are grouped together in this area, too, and include a high-level power socket, as well as the various dials and light switches. There was no way Adria was ever going to be able to fit a huge washroom or palatial separate shower in the Eden’s modest overall shape, but what is provided is perfectly fine for its intended use. Being a family caravan, the Eden will probably spend most of its time on full-facility campsites, so the fully lined all-in-one washroom is more than adequate for the occasional visits to the loo (watch out for the wheelarch intrusion near the bench-type toilet, however) and teeth-brushing that’s likely all that will be demanded of it. That said, you can feasibly shower in here; the tray is of a good size, and the riser a proper jet affair, complete with a proper mixer tap. It is a shame there’s nowhere obvious to put your shower gel bottle, though. Elsewhere, we like the hidden fold-out washbasin and the considerable storage behind the large mirror. There’s one very good reason why the double lounge layout never really goes away: its sheer flexibility. Treated as a family caravan, there’s sleeping for five people, with a good sized double up front (the settees aren’t really long enough to serve as adult single beds) and another double out back, complete with cantilever-style bunk over. Or, couples can leave the rear double made up (but the bunk folded away), turning the Eden into a sort of fixed rear bed caravan. The front bed is pretty much spot on – it’s easy to make up, and the resultant bed is both large and comfortable. The rear, however, has its drawbacks. We’ve no real complaint with the ‘downstairs’ double, but getting the transverse bunk erected (there’s insufficient room for a longitudinal side bunk) requires you to remove every single cushion and backrest – together with the table – first, which is a bit of a faff. In addition, the transverse nature of the bunk means there are metal posts halfway along each settee base in bed mode. Hardly the end of the world, but a slight inconvenience nonetheless. That a caravan this size can sleep up to five people, however, is no mean feat, and something that we’re sure will impress potential buyers. There appear to be roof lockers just about everywhere inside the Eden, and each is of a good size and most are clutter-free. Obviously, the panoramic rooflight up front means there’s no way of fitting lockers over the front window, but the lounge out back is completely encircled by lockers, so there’s room aplenty for clothes. The wardrobe up front has loads of space inside, and ample hanging room for dresses and the like, while the drawer beneath is absolutely massive. An added benefit – in winter, at least – is the presence of the gas fire beneath, which should keep your clothes dry and warm. Nearside bedding locker space is better than average, too, with the void also accessible from the outside. Further back, the bedding lockers are broadly very good and the TV station has two huge drawers beneath that are big enough to keep folded clothing neatly stacked within. So, come the end of the Practical Caravan Adria Altea 472DS Eden review, what do we think? Its interior layout may be nothing new in the broader caravan world, but it’s an intriguing and long overdue addition to a range that otherwise caters for couples or families with large tow cars. It looks the business in its current Silver Edition spec, too, with the alloy wheels and panoramic rooflight particularly welcome additions.